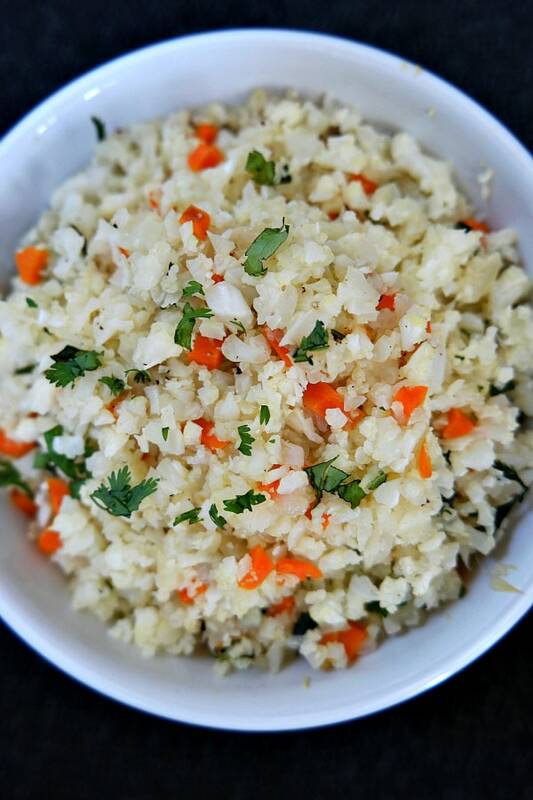 Cauliflower Rice is a healthy, low carb alternative to serving regular white or brown rice. Watch the video showing you how to make this recipe, then scroll to the bottom of this post and print out the recipe so you can make it at home. I’ve read so much about how white rice isn’t necessarily good for you. White rice is more processed, but it’s not necessarily bad. Most white rice is enriched with vitamins to improve its nutritional value. Additionally, its low fiber content may help with digestive issues. Brown is ultimately healthier and more nutritious. I tend to make both of them quite often to serve with some of my main dishes because my family likes rice. But when we are cutting down on carbs, I have a tough time finding good alternatives. Now that I’ve tried Cauliflower Rice, that may change a bit. 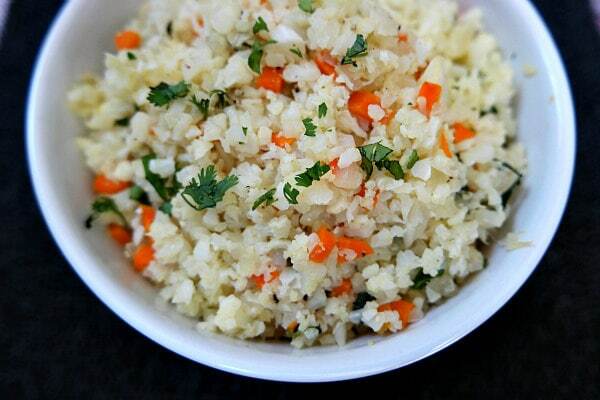 The cauliflower rice is sauteed with butter, onion, carrot, and garlic. Then it’s steamed a little bit with some chicken broth and finished off with fresh cilantro. My family actually enjoys it, and they tell me it’s a nice change. Win win! Just for the record though: it looks like rice and it has the consistency of rice, but it doesn’t taste like rice. It tastes like cauliflower. 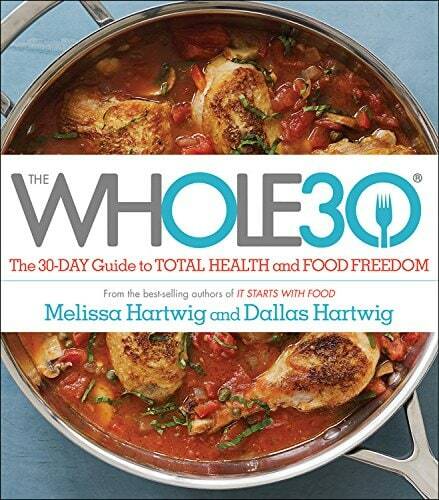 This recipe comes from The Whole 30: The 30-Day Guide to Total Health and Food Freedom by Melissa and Dallas Hartwig: Copyright © 2015 by Whole 9 Life, LLC. I have not participated in the 30 day program that they detail in this book- it’s a 30 day commitment to change your diet and your emotional approach to eating. They’ve led hundred of thousands of people to effortless weight loss and better health with their program, and the detail it all in their book. There are more than 100 recipes using familiar ingredients. I’ve done the 30 day commitment before, and it was a great re-set! I am impressed with the recipes in the book. They’re simple recipes using real ingredients. You’ll find recipes for things like Grilled Coconut Curry Chicken, Baby Back Ribs with Tangy BBQ Sauce, Roasted Spaghetti Squash, Roasted Beets with Grapefruit Thyme Vinaigrette and Perfect Poached Eggs. I use this book a lot when I’m planning dinners for my family. 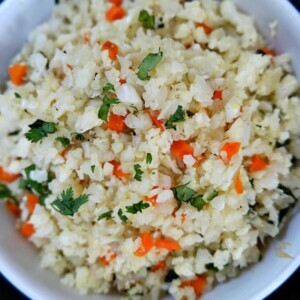 To “rice” the cauliflower, you can gently pulse cauliflower florets in a food processor. If you don’t own a food processor, it’s okay to grate the cauliflower with a cheese grater instead. 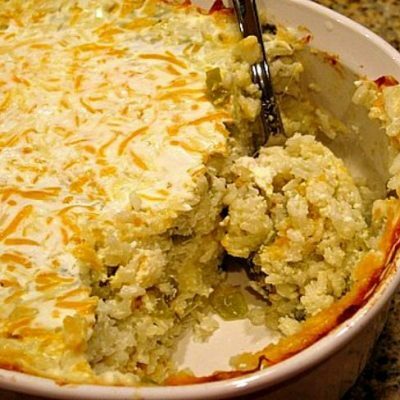 Can you just use the bagged riced cauliflower from the store for this recipe? Nowadays, you’ll find cauliflower already riced and sold in a bag at your market. You can certainly buy the bag and use that in place of buying the head of cauliflower and ricing it yourself. However, keep in mind that the stuff in the bag won’t be as fresh as a nice head of good-looking cauliflower. I always take the time to process or grate it myself because I think it tastes better. Try the cauliflower rice, and let me know what you think! 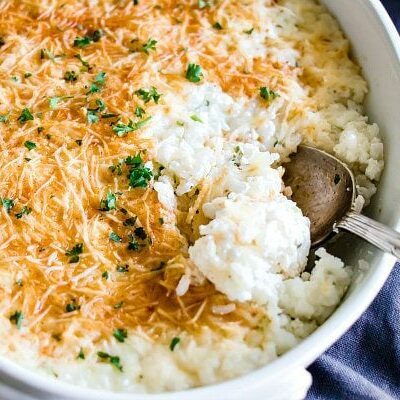 This Cauliflower Rice is a delicious, low carb alternative to white rice. To “rice” the cauliflower, place half of the florets in a food processor and pulse into a rice-like consistency, 15 to 20 pulses. (Don’t over-crowd the cauliflower in the food processor, and don’t over-pulse or the florets will get mushy.) Repeat to rice the remaining florets. In a large skillet, melt the ghee or butter over medium heat and swirl to coat the bottom of the pan. When the ghee is hot, add the onion and carrot and cook, stirring, until the onion is translucent, 2 to 3 minutes. Stir in the garlic and cook until the garlic is aromatic, about 1 minute. Remove the pan from the heat and mix in the chopped cilantro. Adjust the seasoning with salt and pepper. 3 Weight Watchers Freestyle SmartPoints per serving (1/2 of this recipe). The original recipe calls for 3 tablespoons ghee- I reduced it to make it WW friendly. If you don’t have a food processor, you can use a box grater to shred the cauliflower into rice. Patience, however, as it will take quite a while! 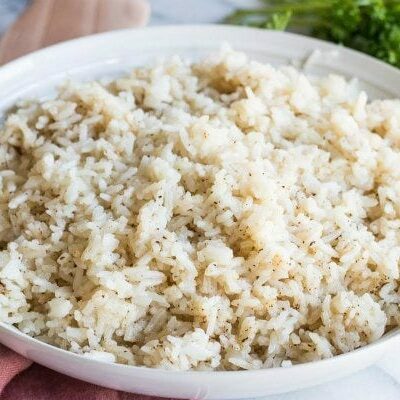 You can also make fried “rice” by omitting the chicken broth, adding more cooking fat to the pan, and pan-frying the rice until tender, about 5 minutes. For an even more authentic fried rice experience, stir two egg whites into the cauliflower while pan-frying. If you are preparing this recipe as GLUTEN FREE, just be sure to use a brand of chicken broth that is known to be GF. This is another incredibly versatile recipe. 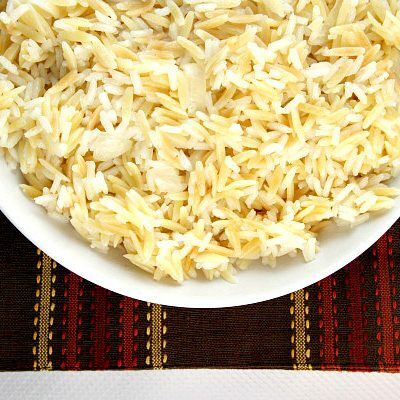 Make a Moroccan-style rice by adding 1/4 cup slivered almonds or pine nuts, 1/2 cup raisins, 1/2 teaspoon ground cumin, 1/4 teaspoon ground turmeric, and 1/4 teaspoon ground cinnamon. Make rice Asian-style by adding 2 tablespoons coconut aminos, 1 teaspoon sesame oil, and 2 minced green onions. Or make this a complete meal by adding a serving of your favorite chopped protein (like chicken, shrimp, flank steak, or pork) and any leftover sautéed vegetables you have in your fridge. Cauliflower rice is my favorite!! This recipe sounds fantastic!! Love this! Easy and healthy? It can’t get any better. This looks SO good! My family would LOVE it! This is such an easy swap for us! The flavor is amazing and everyone loves it. Looks great! I’m excited to try new things with cauliflower. This is one of our favorite things to make. It literally tastes amazing, my son absolutely loves it! It would be nice to know what the serving size is, not just 1/2 the recipe! Hard to pinpoint an exact size for a serving since heads of cauliflower vary greatly in size. Making your own ghee is SO easy and great to have on hand. Great to know. I did another program of eating clean and lasted 6 days before I caved. It’s so hard to leave out dairy and wine! I love the idea of eating healthier though, and I had so much more energy than usual. Maybe I’ll give it another go one of these days! I love cauliflower. This would be a perfect side dish. Im loving cauliflower these days. just made cauliflower steaks last night for dinner! I haven’t tried those yet!